Mucrospirifer are a genus of brachiopods with a long straight hinge line that extends to a point. This gives them a distinctive wing like appearance. The valves are biconvex and have a pronounced fold and sulcus. Mucrospirifers used a pedicle to anchor themselves to the sea floor. Filter FeedersThey were filter feeders taking their dinner from the water that flowed past them. 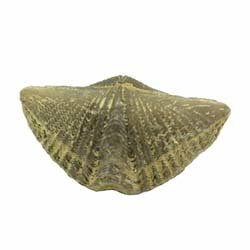 SizeThese brachiopods usually grew to be about 2.5 cm across. There have been found as much as 4 cm across. ClassificationThey are members of the order Spiriferida. This group gets its name from a thin spiral strip of calcareous material that gives internal support for the lophophore. This order belongs to the class of brachiopods called Articulata, all of which have an articulated hinge. The Fossil RecordTheir first appearance in the fossil record is in the Ordovician Period. However they did not become abundant until the Devonian. Spiriferids and brachiopods in general, hit the height of diversity during the Devonian Period. This group survived the Great Permian Extinction and eventually became extinct during the Jurassic Period.